The sensory system consists of sensory receptors at the peripheral endings of afferent neurones, and the ascending pathways in the spinal cord. Sensory receptors exist internally and externally around the body and are activated via different stimuli. They are designed to respond to the body’s interaction with the external environment or its internal state. Sensory receptors are specialised to respond to stimuli of the following: chemical, mechanical, thermal or nociceptive stimuli. Activation of the sensory receptor then results in an action potential, which propagates through fibres of the respective nerve, to the central nervous system (CNS). In this article we shall consider the different types of sensory receptors and some of their properties. Tonic receptors are slow adapting receptors. They will respond to the stimulus as long as it persists, and produce a continuous high frequency of action potentials. Phasic receptors are rapidly adapting receptors. They will respond quickly to stimuli but stop responding upon continual stimulation. Therefore action potential frequency decreases during prolonged stimulation. The receptor remains sensitive to a change in stimulus energy or removal of the stimulus. Nocioceptors are phasic receptors, which respond to noxious stimuli (stimuli that would cause tissue injury if they were to persist) and result in the sensation of pain. The receptors are free dendritic nerve endings, found on the ends of the type Aδ fibres and type C fibres that transmit the pain sensation. These are located in joint capsules, ligaments, tendons, muscle and skin, and respond to deformation by the means of pressure, touch, vibration or stretch. Meissner’s corpuscles: These are phasic present in the dermis of the skin skin, namely on the palms of the hands, soles of the feet, lips and tongue. Consisting of Aβ fibres, they enable two-point discrimination- fine touch. 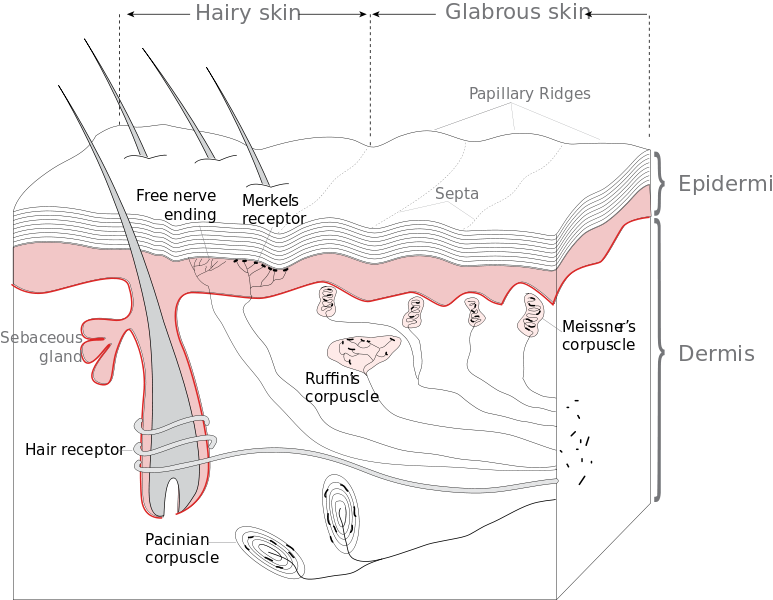 Ruffini end-organs: These are tonic receptors present in the dermis and respond to stretch. Thermoreceptors are phasic receptors found within the skin, liver, skeletal muscle and hypothalamus that respond to changes in temperature. Those responding to warm temperatures are thought to be type C fibres, whereas those responding to cold consist of both type C and type Aδ fibres. Cold thermoreceptors are thought to be around three times more common than those responding to warmth. A warm stimulus results in both an increase in firing for warm receptors and a decrease in firing for cold receptors (and vice versa for cool stimuli). The response is initially phasic, and changes very quickly based on minute temperature changes, however after a time it switches to a tonic response, allowing adaptation to the temperature if it remains constant. Temperature stimuli are transmitted to the central nervous system via the anterolateral system. Further information on the ascending pathways, including this system, can be found here. All modalities have different qualities that can be felt. For example pain can be sharp/aching, temperature can be hot/warm/cold. The quality felt depends on receptor subtypes and on the strength of stimulation. Hyperalgesia is an increased sensitivity to pain, which may be due to damage to nociceptors or peripheral nerves. It is present in many disease states, for example, in inflammation and may serve as a function to prevent further damage. Primary hyperalgesia is thought to be due to nociceptor sensitisation and occurs in diseases such as rheumatoid arthritis. Secondary hyperalgesia is thought to be a result of central sensitisation and is generally found in neuropathic pain. Whilst the mechanism behind this is not clear it is thought that it is at least partly induced by platelet-activating factor (PAF), which is often released in inflammatory responses. It is also important to be aware of hyperalgesia as it may be opioid induced in some patients and is a common reason for a reduction in the efficacy of opioid based medications for pain relief. As it is distinct from opioid tolerance, increasing the dose of these medications does not improve the pain, but worsens it, increasing the sensitivity even further.